Who makes your clothes? This used to be an easy question to answer: it was the seamstress next door, or the tailor on the high street – or you made them yourself. Today we rarely know the origins of the clothes hanging in our closets. The local shoemaker, dressmaker and milliner are long gone, replaced by a globalised fashion industry worth $1.5 trillion a year. In Wardrobe Crisis, fashion journalist Clare Press explores the history and ethics behind what we wear. Putting her insider status to good use, Press examines the entire fashion ecosystem, from sweatshops to haute couture, unearthing the roots of today’s buy-and-discard culture. She traces the origins of icons like Chanel, Dior and Hermès; charts the rise and fall of the department store; and follows the thread that led us from Marie Antoinette to Carrie Bradshaw. From a time when Ralph Lauren and Calvin Klein were just two boys from the Bronx, to the world of the global fashion juggernaut, where Zara’s parent company produces more than 900 million garments annually, Press takes us on an insider’s journey of discovery and revelation. Clare Press is Marie Claire’s fashion editor-at-large. She was previously the features director at Sunday Style and has worked as a fashion designer, brand consultant and editor, including stints as features director at Vogue, fashion critic at the Monthly and columnist at Instyle. Clare’s fashion journalism has been published in Harper’s Bazaar, Elle, Marie Claire, the Australian, the Sydney Morning Herald, the New York Times Magazine and many more. She is a passionate advocate for sustainable and ethical fashion, and sits on the Australian advisory board of Fashion Revolution. I thought this book was great, full of information and extremely insightful. Finally a thorough look at the term sustainable fashion. A must for every fashion lover so you know what your buying! A glimpse into the fashion industry from an inspiring angle. It will change the way you think about every purchase you make. Engaging, engaged but not preachy. Thoughtful and lovingly well-researched. This is the best book I have read since Alice Oswald's "Memorial". I enjoyed reading it, learnt something and had a few chuckles along the way; I strongly recommend it. Clare has really written an amazing book. Her extremely thorough research is brilliant and her passion is contagious. Highly recommended. 5.0 out of 5 starsEveryone with an interest in fashion should read this book! Clare Press is one of the key international voices of today, who highlights the importance of sustainable fashion in her engaging and thought-provoking book. 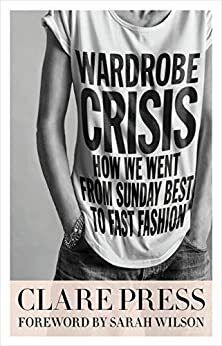 I really enjoyed reading Wardrobe Crisis, and being a designer, I found that the points raised highlight the importance each of us has in making environmentally conscious decisions in the way fashion is designed, manufactured and consumed. 5.0 out of 5 starsHow did we get to the era of fast fashion? Clare Press gives us a lesson in fashion history from a real insider. A wake up call that where we've ended up isn't sustainable. As clothes have become more expendable and less valued in the era of fast fashion, Wardrobe Crisis sounds the alarm for a more ethical and sustainable fashion industry. 5.0 out of 5 starsA must read for anyone who wears clothes! Equally entertaining and informative. Written with a passion for fashion, balanced by a realistic look at its failures and shortcomings. Clare Press presents the underbelly of the garment industry and highlights society’s voracious consumption with honesty, humour and grace. A must read for anyone who wears clothes! This was a smart and refreshing take on the role fashion has to play in our increasingly unsustainable consumer culture. 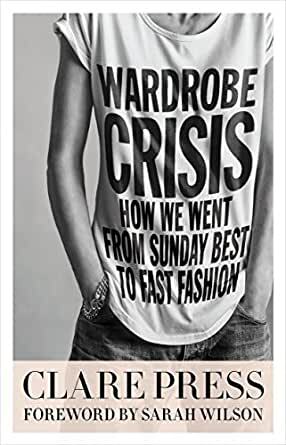 Written by a fashion editor who is one of Australia's leading voices in the sustainable/ethical fashion movement, the book offers a timely and entertaining trip through fashion history to illuminate this crucial moment in history. Loved this book. So inspiring and informative. Everyone needs to read this. Bravo Ms Press.